The Obama Girls, a hula group from Obama, Japan, cheered on the beach at Waikiki yesterday before heading to Kalakaua Avenue to perform in the Pan-Pacific Festival Hoolaulea. Obama Girl, the star of the viral Web video "I got a crush on Obama," has some rivals: the Obama Girls. Today: Ala Moana Center's CenterStage at 10:45 a.m. Tomorrow: Pan-Pacific Festival Matsuri Parade, from Fort DeRussy to Kapiolani Park, at 5 p.m. 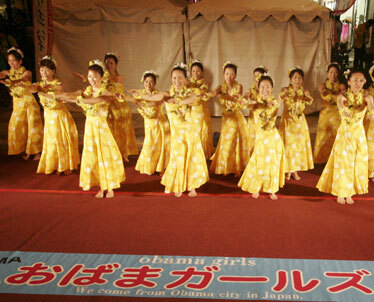 The girls are a hula troupe, some of them housewives, from a small fishing town on the western coast of Japan called Obama. They are making their debut in Honolulu this weekend at the Pan Pacific Festival. As the chances of Hawaii-born Sen. Barack Obama winning the Democratic nomination for president have increased, so has the fame of the Japanese Obama Girls and the desire of the residents of Obama, Japan -- population 32,000 -- to connect with the American candidate. Residents have been supporting Obama and selling T-shirts, bean cakes and candies that say "I love Obama," with a likeness of Obama's face on one side and the back of his head on the other. Yuko Oe, 26, one of 15 Obama Girls who arrived in Honolulu yesterday, said she always wanted to dance in Hawaii. Oe, who works in her parents' "wasi," or traditional paper-making business, said her parents have made Japanese lanterns with the "I love Obama" logo. She was thankful for Obama, adding that his success has caused lots of good things to happen in the town. She said she hoped he would visit the town so the group could dance for him. A crowd gathered on the beach at Waikiki yesterday to watch the Obama Girls, a hula group from Obama, Japan, practice before their performance at the Pan Pacific Festival's Waikiki Hoolaulea on Kalakaua Avenue. When Obama became the presumptive nominee this week, the Obama Girls danced a celebratory hula. They performed last night at the Waikiki Hoolaulea. One of the numbers is their song "Obama Girls," which ends with what they describe as a memorable "I love you, Obama" move. The town first got the idea of promoting the connection in 2006 when Obama told a Japanese television network that he learned of the town while passing through customs, according to the New York Times. The man who was stamping Obama's visa looked up and told him, "I'm from Obama." Obama, pronounced the same as Barack Obama's name, is written with characters that mean "small" and "shore." Officials in Obama hope their namesake will boost tourism. Officials of Obama city also hope to establish a relationship with Honolulu because Obama was born here. Yesterday the Obama Girls and representatives of a support group for Obama visited the mayor's office and the Obama headquarters in Honolulu. They presented a letter to the Mayor's Office from Obama city's mayor asking for a special relationship. They each paid about $1,100 to travel to Honolulu for four days. 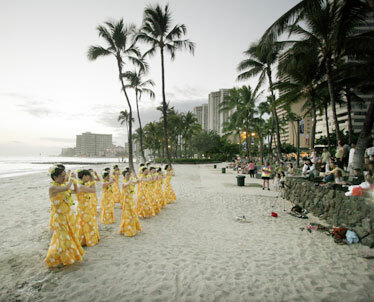 Hula instructor Chikako Shimizu, who is also an aerobics and yoga instructor, said she started the group in January. She had been dancing hula for about two years before that. She said she has been to Hawaii three times, but this was the first time she danced here, making her heart pound "doki-doki." The Obama Girls performed at the festival.